A Fistful of Poetry: TABLOID WAR ON TERROR! 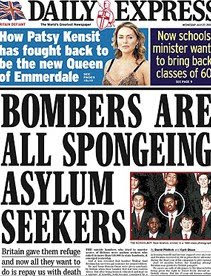 First, they went for the asylum seekers. That they should take their pitiful problems ELSEWHERE! Or anyone with a suspicion of dark skin. Save for the odd sentimental song. Milliband, Mandelson and myriads more. There wasn’t one reader left. OK time for some frivolity. This is my entry for the Palestine Think Tank's [ see link ] poetry competition.PS just changed the image. I have a better use for the other one and this one makes the point better. It's different enough to be noticed.